The other option would be to use traditional-looking Lord of the Rings-style armor for the characters, which wouldn't be nearly as fun in my opinion. Joe Madureira completely negated that on his brief (and disappointing) Ultimates run. Having the old hammer back was one of the few good things about that arc. 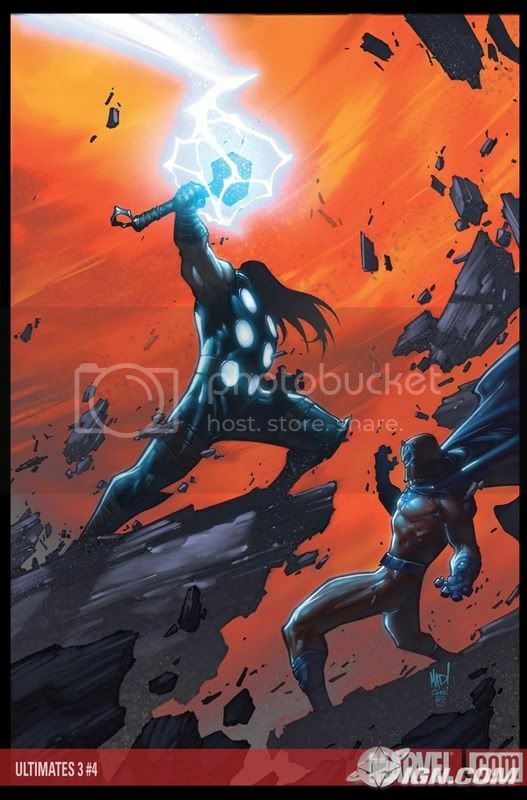 I just looked up Ultimate Mjolnir, because I was lost by all this different hammers talk. And yes, Ultimate Mjolnir is stupid. Mjolnir Prime is the right choice. For America. I am glad people seem to agree with me about this. But I also hate pretty much everything from the Ultimates. The whole, axe/hammer hybrid thing just looks stupid/silly. But I also hate pretty much everything from the Ultimates. There are some good things! - Bryan Hitch and Joe Madureira art. - "Do you think this letter on my head stands for France?!" - "HULK HATE FREDDIE PRINZE JR."
Other than those, yeah, a lot of The Ultimates is very hit-or-miss for me. Ultimate Spider-Man was really the only one I liked the entire way through. Disclaimer: I have never read any Thor comics. I don't understand why Thor gets a place in the Marvel Universe. "Hey, I like vikings. Let's add some Norse gods into the mix!" The company made a conscious effort from the beginning to create superheroes that were real people who happen to have extraordinary powers, heroes that often gained their abilities over the course of their narratives. And here is this mystical god. The Thor trailer looks an awful Shakespeare troupe cosplaying Thor fanfiction. And the fly-through shots of CGI Asgard look poorly done. The trailer seems to suggest that the movie aims to muddle things further by emphasizing wishy-washy psuedoscience babble, probably involving alternate dimensions, in an attempt to make the idea of Thor moderately plausible. I bet the movie will quote Arthur C. Clark's famous, "any sufficiently advanced technology is indistinguishable from magic" at some point. Also, I don't care if that hammer is cannon. It looks tiny and ridiculous. While some kind of giant hammer would be laughably impractical, there is no reason Thor's weapon couldn't be both reasonably sized AND cool looking. I don't mean to bag on this movie too much. While watching the trailer, it struck me just how much Hollywood has changed since X-Men; this movie would never have been made five or ten years ago. There just would not have been an audience for it. But the film threatens to recall the likes of Power Rangers in its blatant self-indulgence. That's kind of what makes him cool - he's a very DC-styled hero (well, technically a Fawcett hero since he's a Captain Marvel rip-off) in the Marvel Universe. So you have all these emotional rejects / freaks running around, and then there's a more traditional hero tossed in the mix. The best way of looking at that is to examine his costume - for the longest time, Thor was the only hero at Marvel with a cape. It's a subtle visual indicator of his different status. And the original idea of Thor had a bit more Marvel to him... but then again, he did fight aliens in his first story out of the gate. It's all a bit odd. Originally, I think the theme was sort of a Christ allegory: Here is this mighty deity cast down to earth to learn humility. His, uh, host body is (was?) a cripple, Don Blake, who found a cane in a cave. When he struck the cane against something, it transformed him into Thor. However, if Thor let go of the hammer for sixty seconds, he would revert. So he had a secret identity (at first) and a weakness (sort of). They sort of lost the theme after a while... you know, what with fighting the Celestials and getting turned into a frog and all. Have you seen any of Jack Kirby's artwork? Asgard was intended to be mind-bogglingly complex. It made sense for gods to live in a place far beyond our imagination. I do agree that they shouldn't try to put much science into it, but instead go the "fantastical technology" route: machines powered by elementals and magic and stuff. Have you ever seen his Hamlet? It's my favorite one so I'm excited for this movie. That is kind of what Marvel's (Kirby's) Asgard always has been. And the fly-over of Asgard was probably my favorite part of the teaser. It was completely unreal and otherworldly. Psuedoscience babble is to be expected, but I don't think it'll make it seem plausible at all. That's kind of beside the point when space-Gods are being banished to Earth. I was exceedingly "meh" about the all of the costume design until someone said "Kirby-influenced" and then I got it and now I love it. The only issue is that Kirby's costumes were never really plausible outside of comics. That's true but I think it's a pretty good blending of "Kirby" and "costumes that are actually physically possible to wear". As for the "wah Shakespeare" argument, good Thor should be not unlike bad Shakespeare, so I think it's doing pretty well. Boy, Reb Brown sure looks good for a 60-year-old. He looks a hell of a lot better than I could of ever imagined and that costume looks solid. Thank god they got rid of the feathery chainmail look, that is something that only looks cool in the comics.Now just to see how the helmet/,mask looks on him. I'm going to post this in this thread in an attempt to undermine DC's film efforts. Think of it as my way of protesting how stupid and terrible smallville is. Doesn't look bad, doesn't look amazing. Reynolds has shown more personality in those 30 seconds than Jordan has in 30+ years of existence. It'd be nice if resulted in Hal turning into less of a boorish jarhead in the comics, but with Johns writing em...unlikely. I was just saying a minute ago that Ryan Reynolds seems like he would be a way better Kyle Rayner than Hal Jordan. It looks fun, though. The flying's a little wonky but the ring effect is pretty cool, and I already love Kilowog. I thought the Green Lantern clip looked pretty good. For a 30 second clip, at least. And Ryan Reynolds seems pretty spot on for Johns's Hal Jordan. Which is really great. Yeah, he does seem very Kyle-ish in the clip. Anyway, it's not quite a movie, but... well... poor Spidey. This is going to be his version of Batman and Robin, albeit without being dragged down via an internationally-distributed film. What...what am I looking at there? I don't understand and I'm not sure that I want to. Movie theaters should do a double billing of The Green Lantern with The Green Hornet, and sell green slushies and green nacho cheese dip (booger dip!) and green t-shirts. This seasons... green is the new black. Photos of the Spider-Man musical that's set to open in New York this winter. Julie Traymor's doing the designs, which is why the Green Goblin is so hideous and why that horrific silver thing is a new villain named "Swiss Miss." Basically, if you didn't think movie Spidey needed a reboot, it sure as hell will after this atrocity kills Spidey's good name in NYC for the next decade. Theatre Majors: Don't Let 'Em Breed. I like the idea of a Spider-Man musical just fine, but the music I've heard from it sounded like they're taking the concept way too serious; combined with those costumes, I can't imagine this going over well at all. I would pay anything to see a guy in a Spider-Man suit swinging around above my head. That would be the ultimate. ... get to Orlando, then. This is some kind of fashion thing right? They're trying to sell the dress that Mary Jane is wearing, aren't they? That's the only way these photos make any sense. EDIT: Oh, it's a musical. Hmm… still pretty awful but more understandable. Am I wrong for being a little excited about this? I can't help but think of the Batman animated show. "♪ Criminals are a cowardly, superstitious lot. ♪"